Tacos Today by Facebook led popular demand! But these are not just any tacos guys. 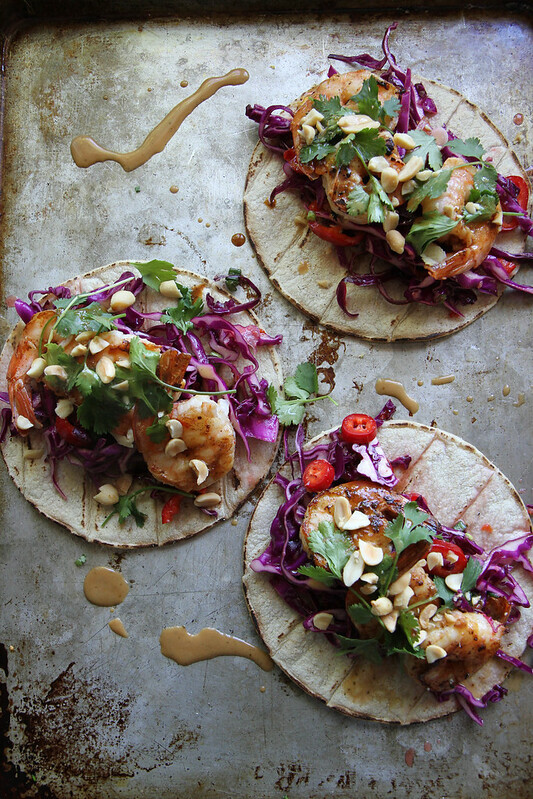 These are Thai Shrimp tacos. Big fat juicy spicy, gingery, limey, honeyey (that’s a word right?) 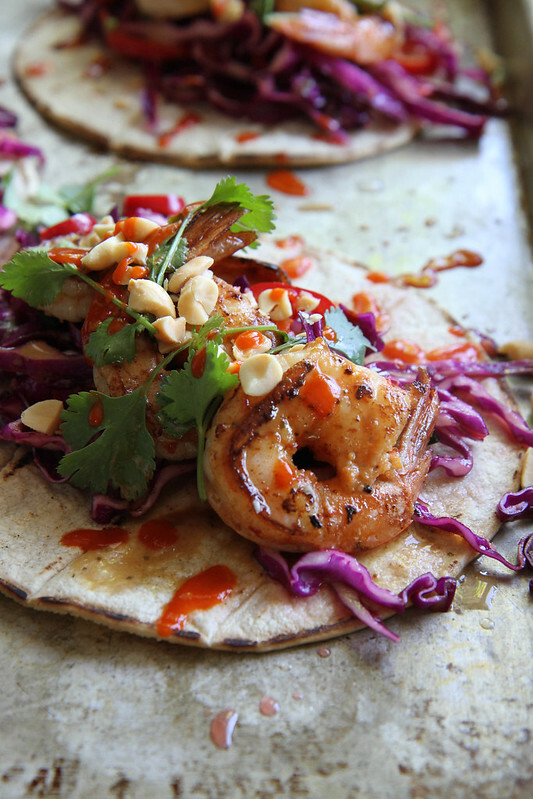 shrimp, tucked into soft tortillas filled with bright delicious cabbage slaw, fresh cilantro and green onions and then drizzled with sweet peanut sauce. Oh. Em. Gee. They are so, so good. Thai food is my favorite. But since the whole “allergy diagnosis” I have been really nervous to go back and try it. Pia is out for sure being allergic to all the flavorings for thai food (eggs, peanuts, gluten, sugar, soy, garlic and ginger) and I get scared that I will miss the addition of gluten or eggs somewhere or god forbid a freaking bean sprout! (did I tell you guys I was severely allergic to bean sprouts!!? gahhhh….) So anyways, this was a way to bring thai food to us. sort of. If the pictures are a little spotty, it’s because I couldn’t spend very much time being bothered with taking them. It doesn’t happen very often, but with these taco’s I just sort of wanted to get it over with so that I could just dig in. And I did. And it would have been embarrassing if anyone walked in and saw me. There was a lot of sauce on the chin involved. As delicious as the shrimp are, I think it is the slaw and the sauce that take these over the edge. The sour/salty/spicy dressing with that peppery cabbage and the sweet, rich peanut sauce are quite the combination. I thought tacos were a good thing to throw up here with the holiday weekend coming. I love having people over for tacos- they are so simple to make the ingredients for and then everyone can just help themselves to assemble. Also, this sauce and slaw could be done a day ahead- it’s even better later (just leave the cilantro out of the slaw until the last minute so it isn’t soggy). Also! I used corn tortillas, but I think brown rice tortillas would be really good with this too (they sell them at Trader Joes). 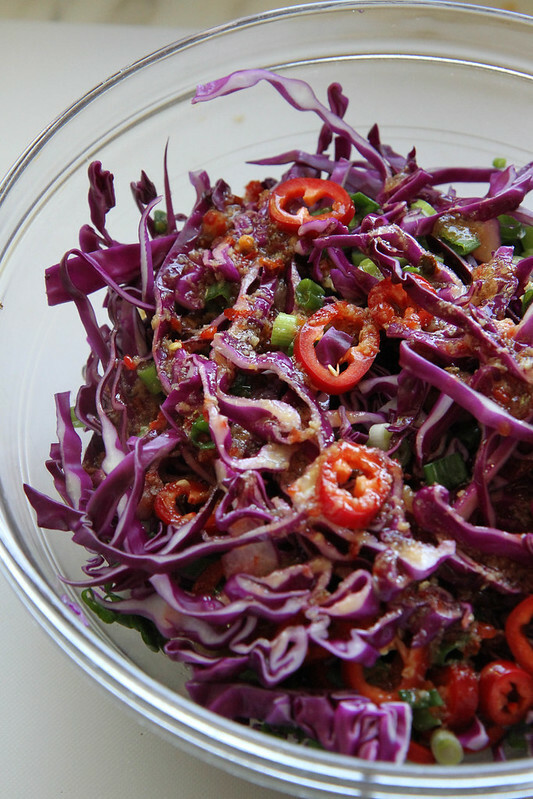 To make the Slaw, in a large bowl combine the cabbage, cilantro, red chilis and green onions. 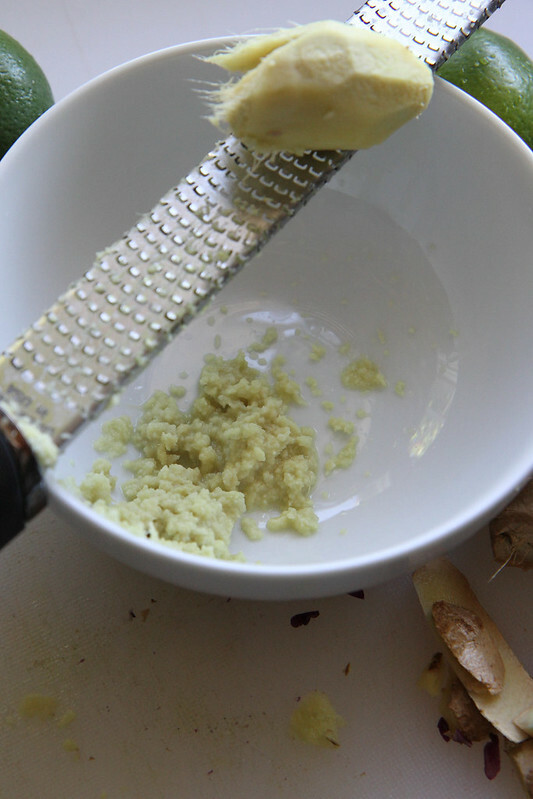 Grate the ginger into a small bowl and add the chili-garlic sauce, soy and honey. Whisk in the lime juice and the vegetable oil. Garnish with a little fresh cilantro. 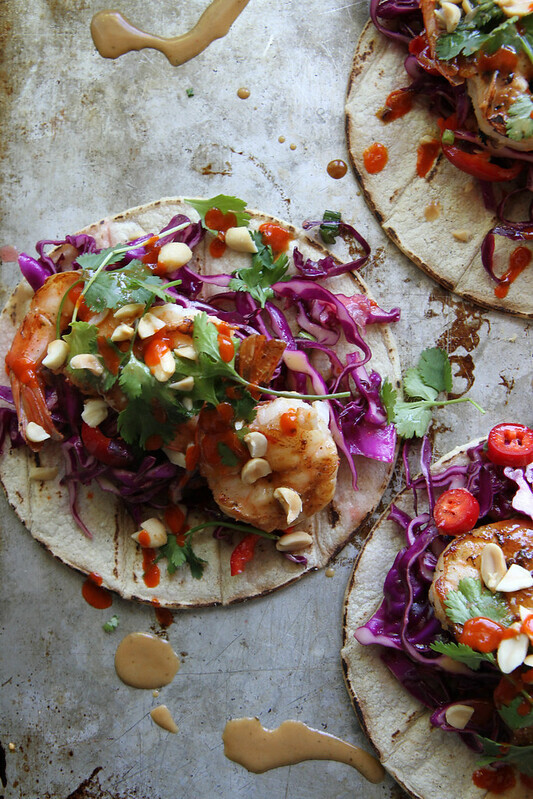 Drizzle the taco’s with peanut sauce. 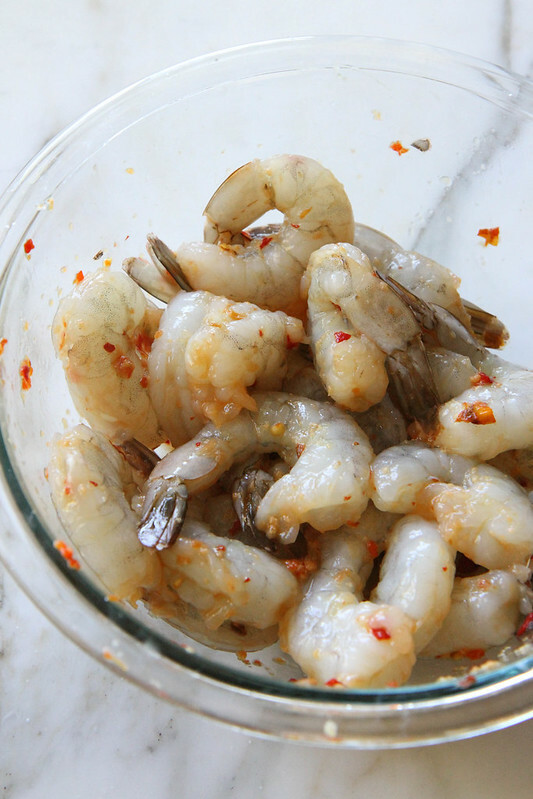 Serve with lime wedges and extra peanut sauce, also siracha if desired! These sound amazing! How are the brown rice tortillas?? I haven’t tried them yet, but luckily I LOVE corn tortillas. The closest TJs is an hour away for me…. so I miss out on a lot of their yummy things!! Such a bummer Collette! I have a friend that lives in Fargo and has to drive several hours to get to a Trader Joes- then she completely fills her car to the brim and drives home! Oh Averie- I always feel so bad when I post shellfish recipes! I’m sorry!! but thanks for the love! Love the pop of purple, the whole dish looks amazing. I don’t blame you for wanting to dig in! Thanks Sherri! Yeah, that purple cabbage was as delicious as it was beautiful! 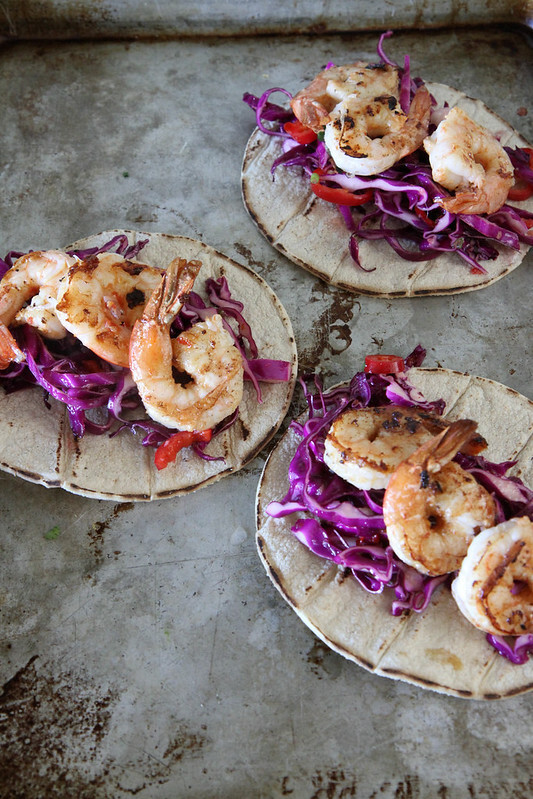 I need to make these tacos immediately, they look killer! These tacos need to be mine! Fabulous favorite flavors! These are calling to me! I think I’ll sub whole beans for the shrimp to veggie-ize them because these look too good to pass up. Out of curiosity, do you have a system for keeping track of the who can have what for the allergies? There needs to be some sort of swap out book for ingredients. Oh Vicki- we have our lists posted up on the fridge and in the pantry. It’s pretty well ingrained in my brain, but I have to be careful that caretakers (babysitters, family members) are equally as aware or we get into trouble. I would love to hear if you do beans and how that would be! I’m obsessed with all the flavors in this! 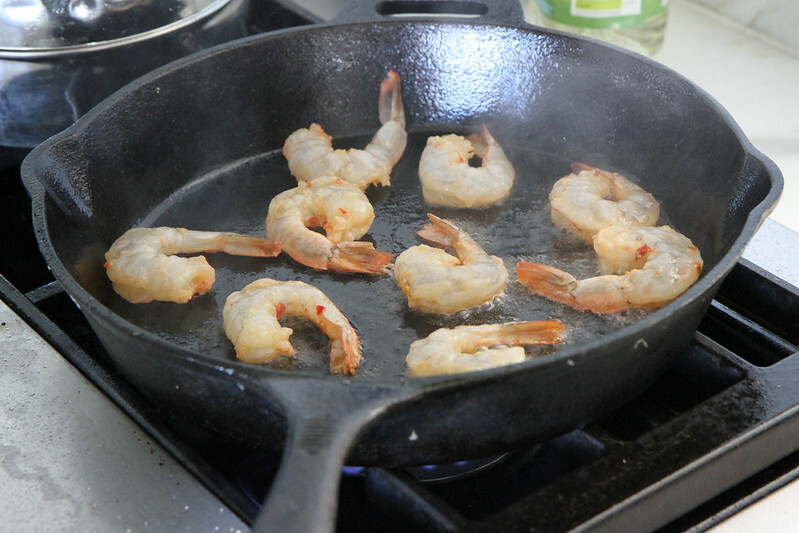 I’m pretty sad that I don’t have any shrimp in the fridge/freezer right now! I’m getting so hungry just looking at these photos! 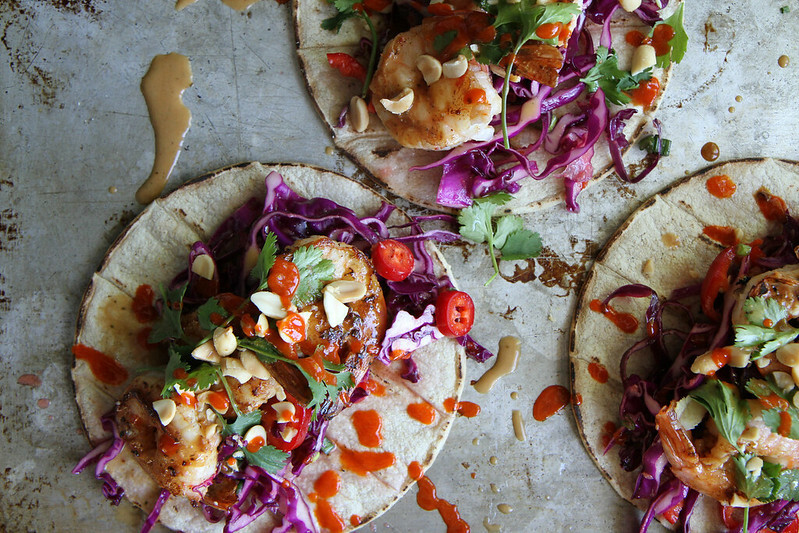 I love Thai flavors and tacos are one of my favorites! Oh yes!! 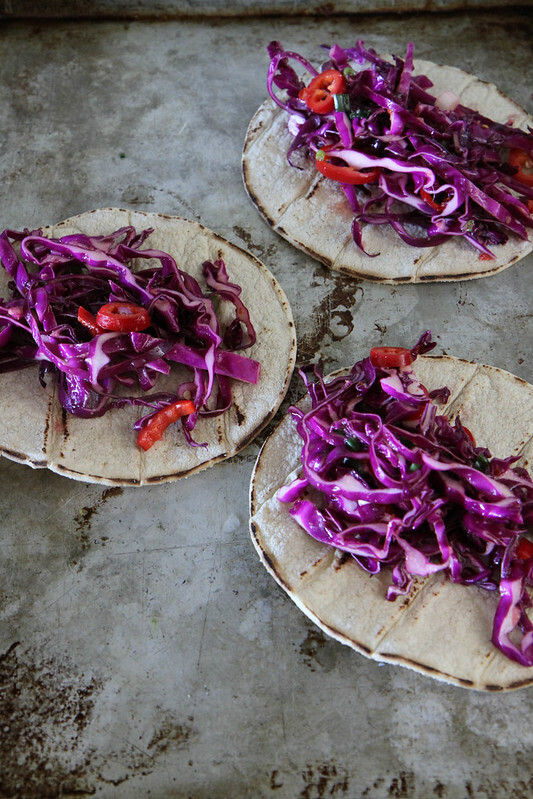 These are great tacos for the long weekend & summer celebrations! Great taco flavors going on! Love tacos for simple summer entertaining!! These have a killer flavour combo. Love them! I love all the color in these taco’s almost as much as I love the flavors! Can’t wait to try out the recipe! Thank you so much Bridget! What a fantastic combination of flavors! I especially love that final splash of color with the cilantro and sriracha sauce, it makes this whole dish pop! Thank you so much Mary Frances! My goodness, Heather, if these taste as amazing as they look then you’re my new hero!! Heather, this looks incredible. 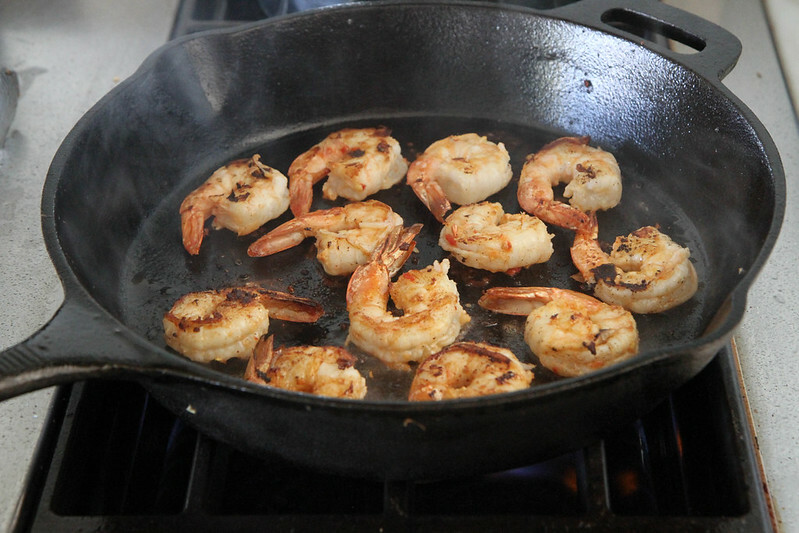 I am going to try it with Argentinian Red Shrimp this weekend. Are the red chili’s very spicy? Should I just omit it for my 7 year old son? By the way, your pics are just beautiful. Well done! Delectable food photos, and I love the combination of ingredients in these tacos. Great to use Thai flavors! Photos are stunning and I could ALWAYSSSSS eat tacos. The end. I just recently found your blog and have tried several of your recipes. 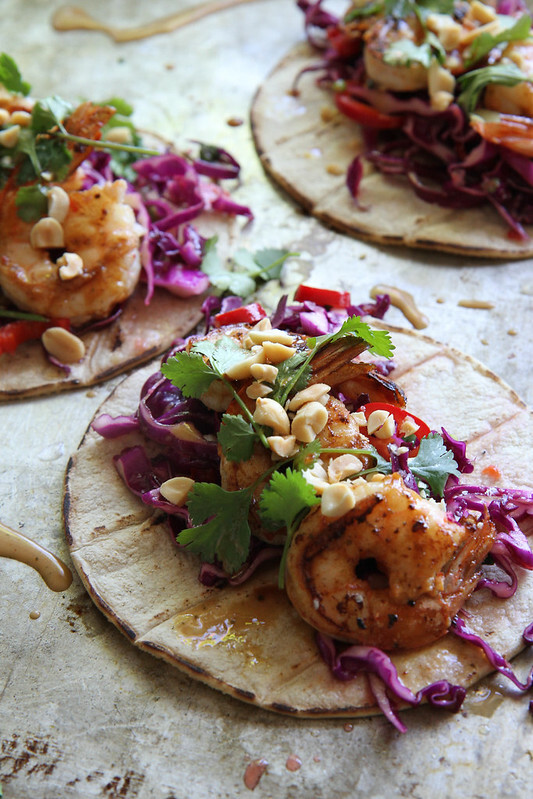 All have been wonderful, but this Thai Shrimp Taco recipe is outstanding! We love the complex flavors. It takes a little extra time to prep all the ingredients, but it is SO worth it! I can’t wait to prepare this for my grown children and their families at one of our our Second Sunday Suppers. thank you so much Gail!! That makes me so happy, and i really hope your family enjoys them! The peanuts don’t seem to be in the instructions. Are they added to slaw? Tossed on top? Roasted first? Photos seem to show them tossed on…. Sorry Lynn! Yes- they were originally in the slaw, but when I re-did the slaw recipe recently OI left them out. If you want them, I woudl just sprinkle on top!